A long-time friend of mine just got home from competing at the 2018 AEC’s at the Colorado Horse Park. In fact, “A” is the one who invited me cross country schooling a few weeks ago. She was doing it to prep for the AEC’s and nice enough to invite me along for the fun. I was thrilled to hear that she was going to compete. A got Bombay 4 years ago when he was 4 years old and green broke, and has done all the training on him herself. Nothing like bringing a horse along yourself and then making it to championships! Huge congratulations girl, I am so happy for you!! Thank you for sharing your AEC story with us today! The 2018 American Eventing Championship was everything I thought it would be: a tiring, humbling, money-sucking piece of Heaven. Take your typical horse trial and then triple everything that goes into it. That’s the AECs. 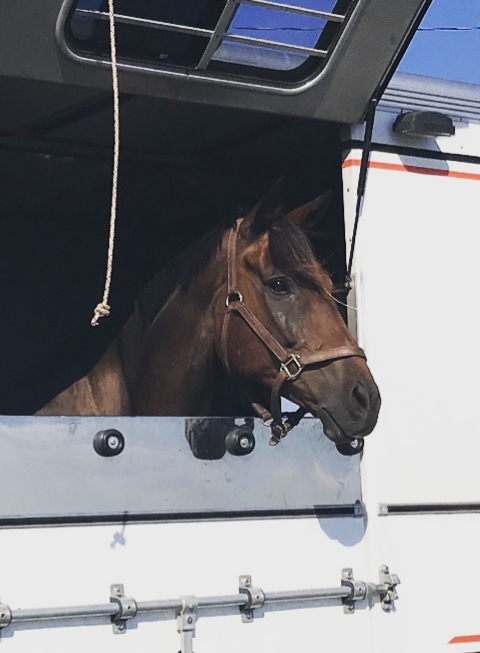 When I learned that my horse Bombay Sapphire (I call him B) and I had qualified, and that the event was going to be held at the Colorado Horse Park (a mere 13 hours away), I thought, “Hmm, maybe I should enter.” I went back and forth for weeks thinking, “No, it’s too far and too expensive,” and, “Yes, do it! One shot!” It’s true, I hadn’t qualified for Championships in some 10-12 years and I wasn’t sure when I’d qualify again. Regardless, there was no way I was hauling 13 hours to Colorado alone, so I left it up to fate and posted a long shot Facebook ISO for a trailer and hotel buddy. Lo and behold, an amazing stranger (now friend!) from my area actually responded and offered to take us along with her horse, so that was that…I got online, winced at the entry fee, and entered the freakin American Eventing Championships. We spent the next month cramming: taking as many dressage lessons as we could afford and headed out cross country schooling a few times. This would be our first event coming off the spring season, so no chance for practice shows! But Bombay felt ready, and off we went to Colorado. It was a long, two day trip, but we made it safely and settled right in. B loved his box stall!